My husband Colby is coming back tomorrow night! The back story to that is he’s been gone since Jan. 8 when he got a new job and had to go to sales training in Chicago. It’s like a 6 week training program so obviously I’m ready to have him home again. Thankfully I was able to fly out there and see him the weekend of the 20th so it hasn’t been too long since we’ve seen each other. In honor of him coming home, and because he won’t be able to be here for Feb. 14th (he has to go back to Chicago for 5 more days next week) I wanted to brighten the living room up a little bit and add some red & pink here and there. On Saturday, aside from just exploring the many interesting places one can explore in Lynn, I was really on a mission to find cute pink/red fabric and some ribbon. I got a little bit of both, but didn’t have much time tonight to do a whole lot (I’m sleepy!). Have I mentioned I don’t really sew? 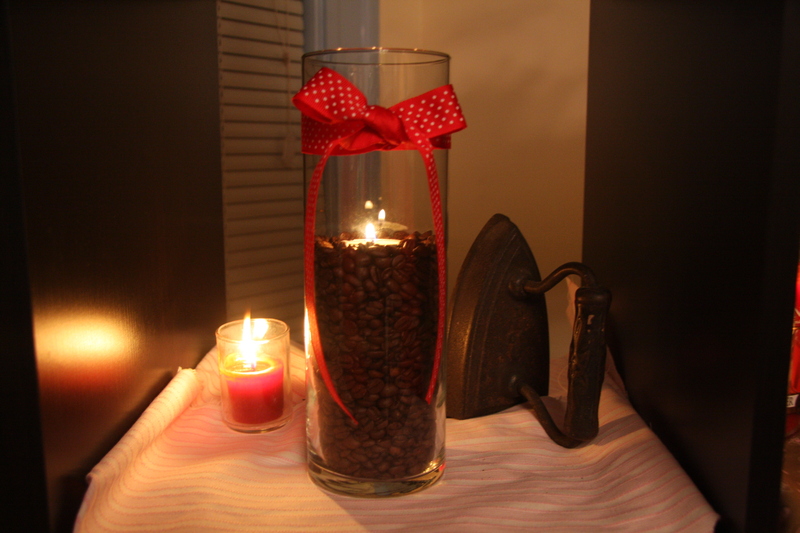 I was thinking of making bunting with the fabric but I haven’t gotten around to that just yet… So really, I just bought the cheapest coffee beans I could find, put them in a plain vase, added a tea light candle, and tied a ribbon around the vase. 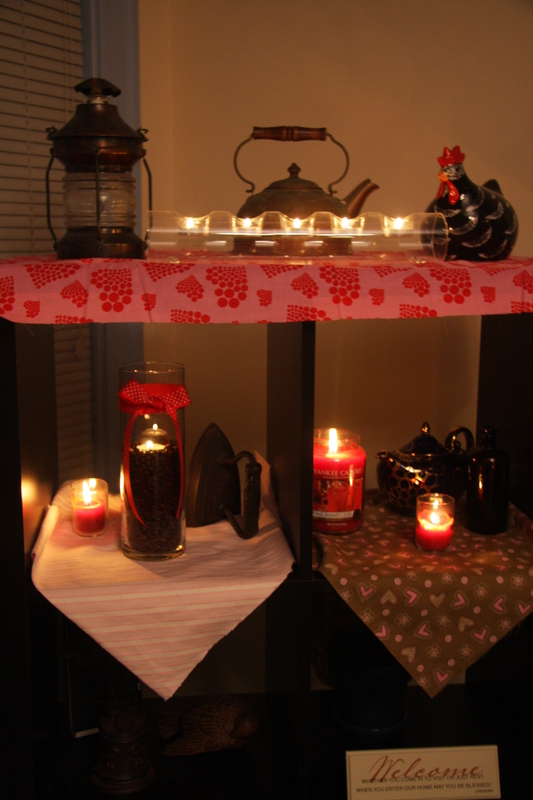 Then I rearranged the random knick knacks on our bookshelf in the living room and lit a bunch of candles. It’s not much, but it’s okay for now. Sweet! And Romantic. He will be impressed 🙂 I like the chicken. 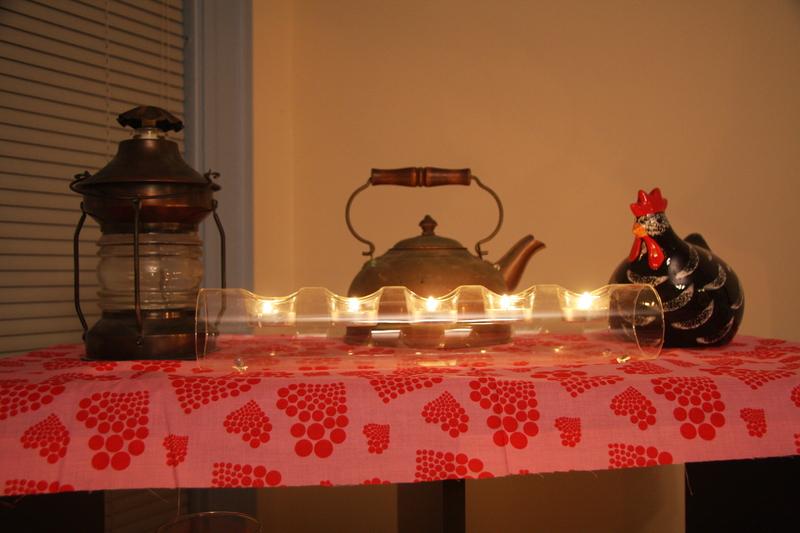 Could you put a light/tea light in your lantern?